Leading Wholesale Trader of alligator clip, hipot tester, contact resistance tester, testing lead, test lead and testing lead for multimeter from Mumbai. Alligator Clips are Fully insulated and easily put in probe tips high quality multifunction Digital Multimeter Probe Test. It is a good kit for replace the multimeter components. Length: About 1m. 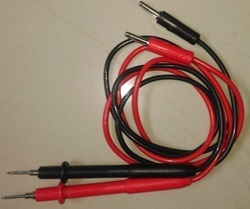 1 Pair Cord Lead Clip to Banana Plug Multimeter Test Probes Alligator Testing. 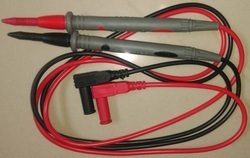 Alligator Clips are fully insulated and easily put in probe tips. The very sharp probe tips are hardened to ensure resist..
UDEY ‘HT-50-150’ AC High Voltage testers are the second generation range ofUDEY’ s famous ‘HP series’ of HV breakdown testers. The main difference is that the output is motorized, timer is added and are compact much lighter in size and weight. ‘HT-50-150’ uses oil insulated high voltage generating transformer, housed in asheet steel tank with rollers and lifting lugs. Voltage source : Copper double wound, oil insulated, high efficiency H.T. Output control : Continuously variable by motorized control. Regulator is Air-cooled. Metering : Analog, 96 mm², linear scaled, kV Meter in the input Analog, 96 mm², linear double scaled. mA Meter in the output.Accuracy: ± 4% full scale deflection. Protection : MCB, a fast acting D.C. relay isolates the H.T. at trip level. Interlocking : Zero-start interlocking for H.V. output. Auxiliaries : Mains switch, Push-buttons for ‘H.T.ON’, ‘H.T.OFF’,‘RESET’,’RAISE’ ‘LOWER’, contactor operated. Indicators : ‘Mains’, ’HT OFF’, ‘HT ON’, ‘READY’, ‘Breakdown”. Termination : H.T. End insulated and other end at earth potential. Control Unit :Houses switches, MCB, lamps, variac etc in a sheet metal case with castors. H.T. Unit :Sheet steel tank with rollers and lifting lugs. 1. Mains wires 3 core, 3 meter long. 2. Inter connecting cable 5 meter long. Measuring the line loop contact resistance by bridges isnot the ideal method as the test current is only a few milli amperes.Thus the value is not the true value ofthe contact resistance. Model MRL is a direct reading tester, and uses a DC test current ,resulting in true value and accurate measurements. ‘MRL’testers adopts digital circuit technique and is used for measuring contact resistance of switch control equipments at test current of 100A/200A DC. The measurements are accurate as the test is highly stable.‘UDEY’ MRL-series is a new, fully automatic micro controlled tester that measures contact resistance at 100A/200A DC with built in printer. 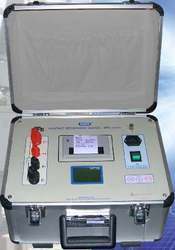 MRL-series is micro controller operated user friendly, accurate,reliable, small, light weight and reliable tester. It incorporates a large LCD screen for display of menu and results. The results are printed on built-in printer after the test is over. It i n c o r p o r a t e s b r e a k t h r o u g h technology and design that gives accurate and reliable results, again and again. RS 232 link is also provided. Current of 100A/200A DC is passed in the contact and voltage drop across the contacts is sensed, processed and the resistance is displayed on screen. 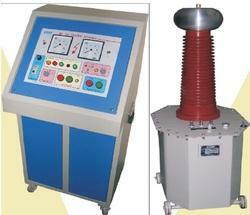 MRL-series is micro controller operated user friendly, accurate, reliable, small, light weight and reliable tester. MRL series incorporates a large LCD Screen for display of menu and results. The results are printed on built-in printer. MRL-series incorporates breakthrough technology and design that gives accurate and reliable results, again and again. A true four terminal measurement is used to eliminate the need for lead resistance compensation. Usage environment:<40º C.< 85% R.H. Flexible testing cable set withalligator clamps, 8 meter long. 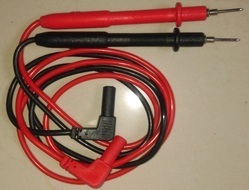 Universal Digital Multimeter & Clamp Meter Test Lead Probe Wire Pen Cable Hot. 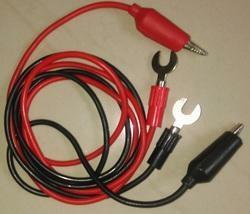 Package includes:1 pair x Universal Digital Multimeter Multi Meter Test Lead Probe Wire Pen Cable. A multimeter probe is an electronic measuring instrument. Featured with high sensitivity AC / DC voltage, it can be applied to measure current, resistance and voltage. Looking for Testing Leads ?